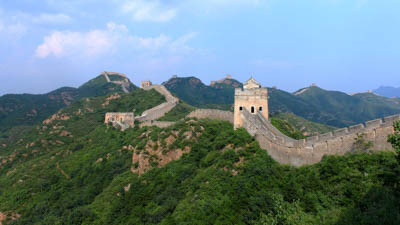 The definitive and most popular tourist attraction in China is without a doubt the Great Wall. It has persisted through generations and dynasties, and defined the borders of the nation itself at times. Multitudes of historical stories and famous quotations speak of great warriors defending their homeland, huge groups of laborers constructing the towers, and the unending spirit of the wall as it relates to the Chinese peoples' ability to weather hard times. Yes, the Great Wall is a sight to behold and an experience not to be missed. And now it's your turn, inspired traveler. The Wall is huge, so where should you go? Many, many options await. From Beijing you can get to various sections via public transportation, or quick day-trip tours. From other northern cities, other sections of the wall are also easily reached. And in the far west, yet even more sections of the wall are accessible. However, some sections are very remote and only accessible via tour or private transportation. So, skip down to the section that best suits your travel plans. If you're only visiting for a day, and if you're visiting one of the more popular areas, then all you really need is a comfortable pair of shoes and clothing appropriate for the weather. However, if you're planning to do a full day hike or even a multi-day hike, be prepared for weather changes. Take rain gear and shoes that can get wet. A hat to protect you from the hot sun will come in handy. Or, if it's cooler, bring layers because the temperature can drop quickly in the evenings. You may also need to bring your own food depending on the area you visit or if you're not on a tour that provides meals. Entrance fees to the various Scenic Areas and Parks that contain the wall can vary. However, most entrance tickets tend to be around 40 to 60 yuan per person. There are often discounts for children, students (bring ID), and seniors, although discounts can also vary by location. Other costs exist at the different sections, such as the cost of cable cars to ascend to the wall, or the cost of the roller coaster rides to descend. Some sections also have museums, both with and without entrance fees. Public transportation to the wall areas will depend on the bus and the distance. Many of the local or regional buses only cost 12 yuan, while others can be as much as 50 yuan for longer journeys. As many of the buses are associated with the Beijing system, having a Beijing bus pass will usual give you a discount, if not a more convenient way to pay your fare. The cost of food and lodging also varies, depending on the popularity of the section of the wall. The more highly visited sections of the wall such as Badaling and Mutianyu can have steep costs for food, as much as twice that you would pay for the same meal back in Beijing. It can be beneficial to bargain, negotiate, or bring your own food if you wish to save some cash. Many sections of the Great Wall are accessible near China's capital. After all, the wall was originally built to protect the capital and its surrounding countryside. Some of the areas near Beijing are fully restored and very busy with tourists, while others are unrestored, untouched, and see very few visitors. It is possible to reach many sections via public transportation, while other, more remote sections require private transport such as a car, a group tour, or a very well paid taxi driver. Below, we will cover sections of the wall that can be reached via public transportation as well as via organized tours. The most visited and easiest to reach section of the Great Wall sits at Badaling. Due to a direct bus line from the central area of Beijing, this part of the wall can be reached via public transportation quite easily, and thus draws in a large crowd. This section of the wall is also well restored and offers many conveniences to distract you from the wall itself. Here you will find food vendors, restaurants, hotels, a cinema displaying a historical overview, a large museum, various roller coaster rides and cable cars, and the list goes on. Expect crowds, especially from Chinese tourists. This section is also good for kids because of the rides and other attractions. Another reason why this section is popular is wheelchair accessibility. The wall itself is made up of smooth stones that are easy to walk along with some ramps, stairs, and cable cars to take you up and down. At the entrance area of Badaling are restaurants and hotels. Expect crowds and a lack of authenticity. The longest and most restored section of the wall open to tourists, the Mutianyu section is another pinnacle of tourism along the Great Wall. It's easy to get here, and easy to walk along the wall. And with plenty of food vendors, several nearby hotels, and a multitude of other fun attractions, it's no surprise that you won't be the only tourist strolling along the wall here. The Mongol hoards are long gone, and in their place are several cable cars to get you up and a taboggan / roller coaster ride to get you back down the hill in style. Or you can walk, but that's not why you came to this section of the wall, right? This section is great for kids or the elderly, as the walking is easy and it's wheelchair friendly. Kids will love the combination of the historical sections of the wall mixed in with the rides and other attractions. The "village" at the base of the hill is also very convenient for everyone, as there is food, lodging, and more amenities to make life easier. The partly-restored area of the wall at Jinshanling is a good mix of tourism and quiet solitude. While part of the wall is restored and in good shape, part of it is still as it has been for hundreds of years, allowing a good glimpse into history. This is one of the most popular areas to hike along, as it contains an unobstructed route for about four hours to the Simatai section, or another 5 hours in the other direction to the Gubeikou section (or start in one of these other sections and hike all the way through). Over 30 watch towers can be seen in this area, many of them unique, and some that are two stories. The views into the countryside and along the wall are also quite nice. A cable car from the ticket booth at Jinshanling can take you up to the wall, or you can hike up the trail. Also at the ticket booth is a hotel and a restaurant. From Beijing's Dongzhimen station, take bus 980 to Miyun Town (1.5 hours). Then, take bus Mi25 to the Wall area at Gubeikou (1 hour). Inquire with the bus driver about where to get off. Bring food and water. The unrestored and beautiful area of the wall at Gubeikou ("ancient north pass") is a recommended location due to the ability to see the unrestored wall as it existed in the past. Here, over 130 battles took place. Several of the towers are unique in their architecture, and the scenery is rugged and mountainous. The trail is well worn, and so it is easy to hike, although there are some hefty hills to climb. 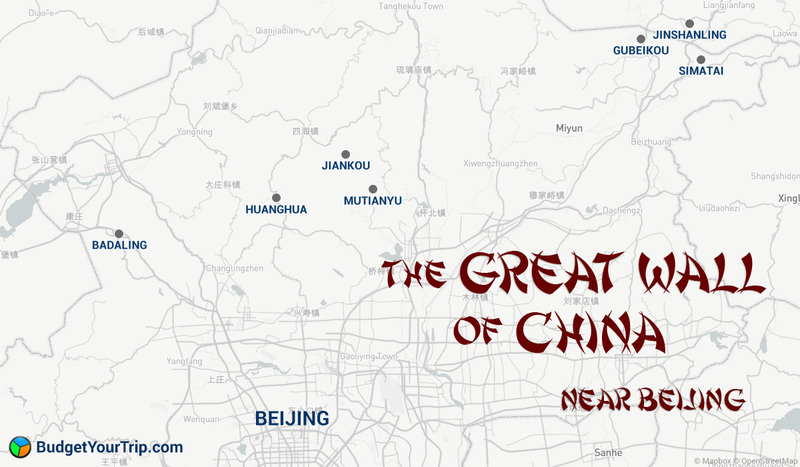 It is possible to hike westward from Gubeikou to Jinshanling, and this takes around 5 hours. Stay at the nearby Great Wall Box House hostel if you need to, or if you are interested in multi-day trekking. From Beijing's Dongzhimen station, take bus 936 to Yujiayuan station. Then transfer to bus H25 to Xizhazi village. From this village, you must walk about an hour to the wall. Various trails leave the village to different sections of the wall. Ask a local, or take a guide, or bring a GPS device. Bring food and water just in case. This mountainous section of the wall is probably what you've seen in postcards and photos. Here, the wall traverses up steep ridges, offering stunning views of the surrounding countryside and mountains. For better or worse, the wall here is unrestored and can be a bit challenging for hikers that are not used to rugged terrain or loose rocks. On the bright side, tourists are few and far between. Be warned, if you're not ready to climb some steep steps on a some loose bricks, don't venture to this area. From Jiankou, headed westward along the wall, hikers can reach the Mutianyu area in about 5 hours. As you trek along the wall, you will enter the more repaired sections and end at the very busy and restored Mutianyu area where you will find many convenient services (see the Mutianyu section of this article for more details). For public transportation purposes, it may be easier to trek in the opposite direction from Mutianyu. From Beijing's Dongzhimen station, take bus 980 to Miyun Town (1.5 hours). From there, take a taxi to the Simatai Great Wall. You will need to negotiate a price with the taxi driver. Some say that 200 yuan is a reasonable price for a round trip taxi. Do not expect taxi drivers to speak English. Due to crowds, the number of visitors to this section is limited on a daily basis. However, reservations can be made in advance at wtown.com. Minimal restoration of the wall at the Simatai area has taken place to shore up the structure of the wall while still maintaining its original appearance. This means that visitors can see a somewhat crumbling, yet safe, wall to trek along. Here, the architecture of the wall is said to be some of the best, and the scenery is mountainous and breathtaking. Many segments of the wall here run along steep mountain ridges and climb to dizzying heights. From east to west, the wall goes up the mountain, and the trek can be physically challenging for those not prepared. The cable car can take you up to (or down from) a spot close to the top western area if you don't want to climb. The eastern part of this section contains a reservoir, and a zip-line is available to take visitors down from the wall quickly over the water. A small village area is located at the entrance to the park, and here you will find a few restaurants and hotels, along with the cable car station. A unique area for visitors, the Huanghuacheng section is where you can see the Great Wall border a picturesque lake with stunning mountain vistas all around. In summer, the entire nearby town blooms with yellow flowers ("huang hua" means "yellow flower"). Visitors can walk along the lake, viewing the wall and surrounding scenery. Pleasant boat cruises along the lake are also an option. Visitors can also climb the sections of the wall as they wind up the steep hills, but the wall is not restored and sturdy shoes, and a positive attitude are required. The views from the upper most tower are grand. A few small restaurants are available once you are in the scenic area. Local villagers also open their houses for meals as well as lodging if you wish to stay the night. Single-day trips and multi-day trips are available from various travel agencies and tour companies. 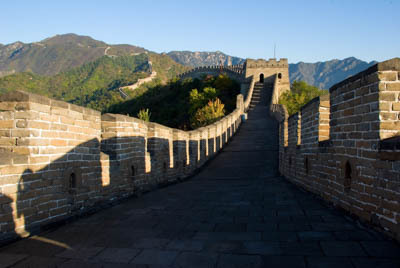 Almost every hotel or hostel in the Beijing area can hook you up with a tour, all you need to do is stand still in your hotel lobby for a little while and eventually someone will ask you if you want to go to the wall. Joking aside, inquire at your hotel or book via one of the links on this page. Single-day tours usually include transport and lunch, or even a snack. Multi-day tours often drop you off at one point and pick you up at another. Some do not include tour guides, so make sure you get instructions as to where you need to go to be picked up. Meals are usually provided, but again, make sure you know what is or is not included if you take a multi-day tour. Expect to walk, and be prepared to climb a good number of hills and steps. In winter months, there may be snow as well. The Leo Hostel in Beijing offers a tour to a section of the wall near Badaling that it refers to as the "Secret Wall" as a day trip. The tour leaves from the hostel (located in a hutong just south of Tiananmen Square). This section of the wall is not refurbished but still walkable. Essentially a public park area with no other infrastructure or amenities, it's open to the public, but there is nowhere to eat or other services. This keeps out the masses and allows visitors a chance to walk along the somewhat crumbling and very hilly section of the wall and its towers without any other visitors except those arriving on the same bus. The hostel provides a lunch, and public bathrooms are available. The further you get from Beijing, the less visited the wall will become. This allows those who do visit these remote, but still worthy sections of the wall to have uninterrupted views and a bit more solitude while taking in the history and magnitude of the structure. 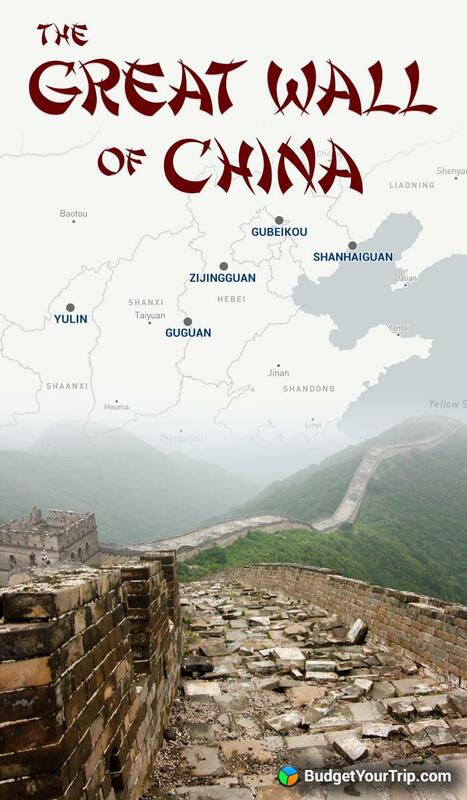 To reach this section of the wall, take a minibus from the Jixian county station to the Huangyaguan Great Wall scenic area. This nicely restored section of the wall sits to the northwest of Beijing. It's a great spot to take in the natural beauty and history of the wall. A museum also gives a great overview of the history of this section of the wall, and the rest of the wall in general. Also, an interesting maze is located here, as is a unique water gate allowing a river to pass beneath the wall. Every spring, a marathon is run here along the wall. Local villagers at the base of the wall open their homes for restaurants and lodging if you need services. Hebei is the province that essentially surrounds the metropolitan area of Beijing. To the northeast of Beijing, near the sea, lies two very important and impressive sections of the wall. Take the high-speed train from Beijing or Beijing South to Shanhaiguan. The fortress is a 10 minute walk north of the train station (or take one of the many buses), and the Laolongtao Scenic Area by the sea can be reached via buses 13 or 25. The Great Wall of China eventually runs eastward into the Yellow Sea. At the point where the wall meets the sea, two impressive and historically important sections of the wall can be found. 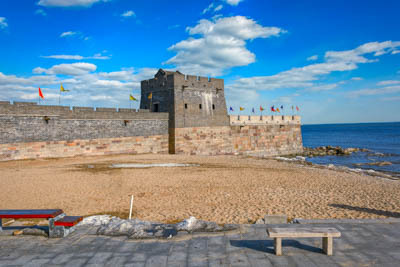 Laolongtao ("Old Dragon's Head") is the tower at the shore, and further inland lies the massive Shanhaiguan Fortress at a strategic mountain pass. The preserved and restored walls around Shanhaiguan Fortress form a rough square several kilometers wide, and inside is a town with a historical feel. Plenty of homes, restaurants, shops, and a few hotels can be found in the town. At the center is a drum tower to keep you oriented. A museum providing a terrific overview of the history of this area of the wall can also be found in the town, as well as various towers and gates to be inspected by visitors. At Laolongtao, the wall descends straight into the sea in the shape of a dragon's head. A lone tower sits at the end, waiting for any invaders to come ashore. Alas, the only invaders now are the tourists. But compared to other sections of the wall, this area is not overrun. Food and lodging are available. Various historical and educational attractions are also located here, plus a few temples. This area is worth a visit not just for its historical significance, but also because there is a lot more to see than just the wall. Take a taxi or private transport from the Shanhaiguan train station, as no public buses are available to this location. It's about 5km north of station, and a taxi should cost around 20-30 yuan. An entrance fee is charged at the gate. A bit further north of Shanhaiguan is the wall section known as Jiaoshan. This is a rugged mountainous area and some sections of the wall here are quite steep, and there are many steps. However, the wall is well restored in this area. At the highest peak is a tower offering amazing views over the surrounding mountains on a clear day. A cable car is available here to take visitors part of the way up the hill. From Dandong train station, take bus 215B at 6:30 AM (this bus may be extremely crowded!). Or take one of several public buses from the Dandong long-distance bus station. Or take a taxi, but arrange for pickup as taxis at the wall are scarce. From here you can see North Korea! This Ming Dynasty construction (1469) was built in the far northeast to keep out invaders from this region such as the Jurchen, Korean, and Japanese. The height of the mountain was of grave importance to the defense of the region. From the top most vantage point, visitors can look over a wide valley and the Yalu River, the border of China and North Korea. The climb to the top takes several hours. A museum is also onsite providing more information. Also, a small road leads visitors out to the valley where you can come within a few meters of North Korea. The wall extends for thousands of miles westward through diverse terrain, and multiple Chinese provinces before reaching the final fortification at Jiayuguan in Gansu Province. In Hebei, visitors can find various sections of the wall which are not connected to the main line of the wall, or spur away from the main line. In fact, some of these sections are further south than the city of Beijing, as invaders in historical times came from every direction. Smaller wall sections were built piecemeal to guard against important geographic areas such as mountain passes, rivers, or valleys. Later, these sections were all connected into larger, longer walls. Take the K601 train from Beijing to Baijian. Then, take a taxi to the wall scenic area. The entire trip takes around 4-5 hours. Here, the wall defends an important mountain pass ("Zijing guan" means "Zijing pass"). The wall here has been around since the Warring States period (476-221 B.C.) and was then built again during the Han Dynasty (206-220 A.D.). Over the years it was added on to and rebuilt many times. A maze-like structure was created with the wall at the pass, providing even more defenses against those pesky Mongol hoards, as well as providing modern visitors with more interesting areas to explore. From Beijing's Yongdingmen bus station, take a bus to Laiyuan (3 hours, 70 yuan), then take a taxi to the entrance area of the wall at Wulonggou. This area of the wall is not just known for its beautiful mountain scenery, but also for the high density of towers along the wall. This is only one of two sections with towers as dense as this, and in one particular kilometer of the wall, a dozen towers can be traversed. Also, a nice fort is located at the base of the mountain. Some of the wall here has been restored, some not, and some partially restored. Hikers need to use care on the unrestored sections as bricks can be loose. From Datong Xinnan Passenger Station, get to Daixian County by bus (2 hours). From the bus station, take the bus to Yanmenguan for around 30 yuan, or take a taxi to the scenic area for around 100 yuan. Admission is around 100 yuan. Various fortifications, towers, and gates make up this architecturally unique section of the wall. The landscape is rugged here, and the walls and gates were positioned in such a way as to both take advantage of the height of the hills as well as confuse enemy invaders. A large reservoir is also on the site, and could have been used for defensive purposes as well. Some of the wall and towers are more restored than others, although all are relatively easy to get around if you have good shoes and a sure footing. Restaurants are nearby. First, get to the town of Yangquan, either from Datong (5 hours) or Taiyuan (2 hours) by bus or rail. If you arrive in Yangquan by bus, walk to the train station which is 400 meters west of the bus station. At the Yangquan train station take a minibus to the Guguan Wall tourist area. Admission is 30 yuan. This well-preserved section of the wall is a nice area to visit. With its original construction in 398 B.C. and various reconstructions from other dynasties over the years, there is plenty of history to go around here. Visitors today will see the remnants from the Ming Dynasty (1368-1644) with renovations performed by locals in the late 1990's and early 2000's. This section of the wall guarded an important mountain pass, and towers, gates, temples, and the dreaded barbican are all on display. It is possible to hike for a total of about 20km along the wall here if you leave the main gate and fortress area. The wall ascends many hills, and from the towers at the top the views are terrific and vast. The wall in various forms, both restored and states of decay, stretches through a large swatch of the Shaanxi Province from the northeast to the southwest. From Yulin, take bus 3 or 11 from the city to Zhenbeitai Great Wall Area, which is about 7km away. Or, take a taxi (around 20 yuan). The entrance fee is 20 yuan. Being near a major city, the wall sections near Yulin are perhaps easiest to reach. The walls here were built long ago and were upgraded and rebuilt over multiple dynasties throughout centuries of both peace and war. Zhenbeitai Tower, built in 1607, is the largest watchtower of this area, and nearby Jian'an fort is also historically important. The tower and surrounding wall areas are restored but many of the other sections of the wall outside of this tourism zone are not, so tread with care. Several other forts are also near Yulin, including Weiwu and Changle. Take a taxi or arrange private transport from Yunchuan to the Sanguankou tourist area (1.5 hours by car). A small section of the wall at Sanguankou has been preserved along with some towers. However, this area is best known not just for the wall and its ruins, but also for the multiple other archeological discoveries in the area. Here, stone age relics have been found of early human life. A local museum explains everything as it relates to both the wall and to Chinese civilization as a whole. The local landscape is desert and hilly in parts, giving the wall here an interesting and unique appearance compared to the rest of China. Other than the small restored section, expect the wall to be in a very extreme state of attrition here. From Jiayu City (or Jiayuguan City), take bus 4 or 6 to the Jiayu Fort Tourist Area (both buses weave their way through the city). Then, take a shuttle bus from the main road to the tourist area (100 yuan) or walk the 1km to the entrance. Admission is around 125 yuan in the high season. Although some say this is where the wall ends, most like to say that this is where the wall BEGINS. This westernmost fortification of the Ming construction of the wall is historically important but also impressive to behold. For starters, it was an important location along the Silk Road. Construction began in 1372, and the architectural style here is noticeably different than the walls in the east. Sitting in the Gobi desert meant that the fort and the wall needed to be created from local materials, and so the fort was built from layers of soil instead of bricks. The fortress forms a large square, with a town in the middle. Various towers, gates, and pagodas are restored and open to visitors. The fortress also has a moat, a museum, some temples, and an opera theater in a tower. Bikes can be rented if you want to ride around the large complex faster than you can walk (recommended). Restaurants are available at the tourist area, and lodging is available in Jiayu City (10km away). Take a bus to the First Abutment from the Jiayuguan bus station. Your entrance ticket to the Fortress and Hanging Wall will also allow entry here. Although the fortress at Jiayuguan is the important area of the western end of the wall, the actual, physical "end" of the wall is 8km south of the fortress. Here, remains of what was once the wall and a tower sit in a lonely position guarding the bleak desert landscape surrounding it. Yes, this unrestored pile of stones is the end of the Great Wall of China, and it goes out with a whimper, not a bang. An observation tower and a museum with dinosaur bones give you more to look at. And a zipline provides a little more entertainment, too. Food and water are available at restaurants. Public transport does not go to the Hanging Wall, so a private car or taxi is required (30 minutes). Your admission ticket to the Fortress and First Abutment also allows entry here. 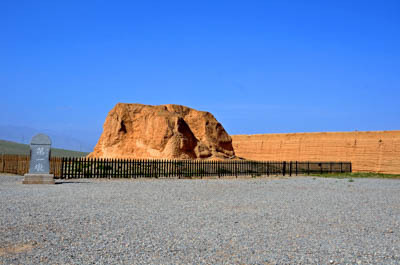 Eight kilometers north of Jiayuguan Fortress, the wall heads up into the mountains. Here, the wall appears to hang from the steep hillside, thus its name. Visitors can climb the steep steps to the top of the wall along the ridgeline, but it's quite a hike if you're not in shape. The wall is restored and safe, though, so give it try. In the valley, visitors can see a water gate. Finally, a weaponry museum also provides information about the military defense of the wall in this location. However, the invading hoards are no longer available for a live demonstration. The Great Wall of China is so vast, that it would take an entire lifetime to see it all. Picking and choosing the locations that you wish to visit based on your travel plans, historical interest, and desired level of physical exertion is probably the best method route. But no matter which area you visit, the grandeur and magnitude of the wall will surely leave a lasting impression.